Come to the Nauset Job Fair and apply for hundreds of openings in all fields. Recreation, Restaurants, Municipalities, Banks, Healthcare, Motels, Retail Stores, Landscapers & More! Each registered company will be provided with at least one 4’ table and 2 chairs, plus a table sign with your company name. Employers should arrive by 2:15PM for booth set up. Employers should consider bringing company info, job descriptions, job applications, pens and pencils, stapler, paper clips, promotional materials, and complimentary refreshments. All booths should remain set and staffed until 5:00PM. Posters are on bulletin boards in each of the participating towns. An 8.5" x 11" insert will be in the editions of the Cape Codder and the Banner immediately prior to the event date. 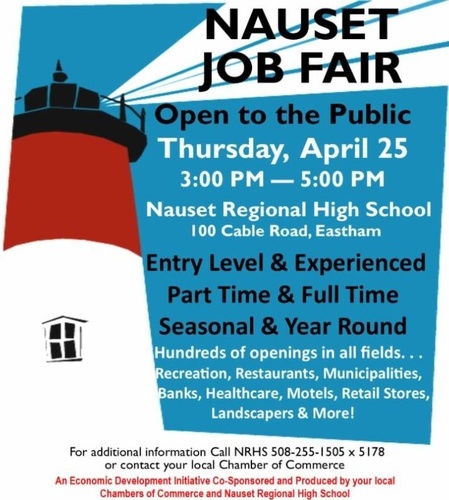 The Nauset Job Fair is brought to you by Nauset Regional High School and the Brewster, Orleans, Eastham, Wellfleet, Truro and Provincetown Chambers of Commerce. FREE for attendees and employers!